A single plant that has been alive almost 5,000 years is hard to imagine, almost unfathomable, yet one does exist. Pinus longaeva, the Bristlecone Pine has a representative in the White Mountains of Eastern California called Methuselah, that was measured by core samples at almost 5,000 years old. This one tree was just a seedling around the year 2750 B.C. The time of the great pyramids of Egypt! The time of Stonehenge! Alive during the invention of writing by the Sumerians! All this time and so many changes on the earth, yet Methuselah is still living in California! 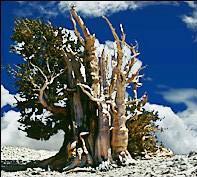 The oldest Bristlecone Pines live at elevations of 10,000 to 11,000 feet in exposed, windswept, harsh environments. This bristlecone, Pinus aristata, is spotted. The white resinous splotches cover the entire plant, making it look like it’s covered in snow. I like the spots, they are both pretty and peculiar. As expected, this plant is extremely slow growing, with a shrubby picturesque look, giving interest to any landscape. The bristlecone pine can grow in infertile, dry or rocky soils and grows 8 to 20 feet high. 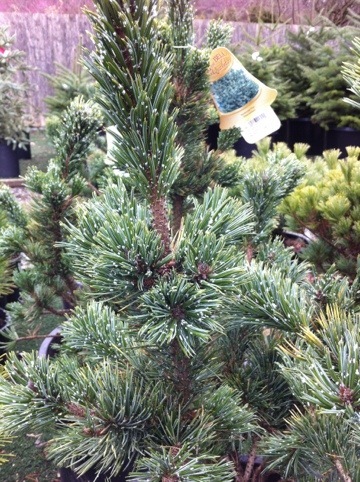 Make your garden historical with the beautiful Bristlecone Pine. 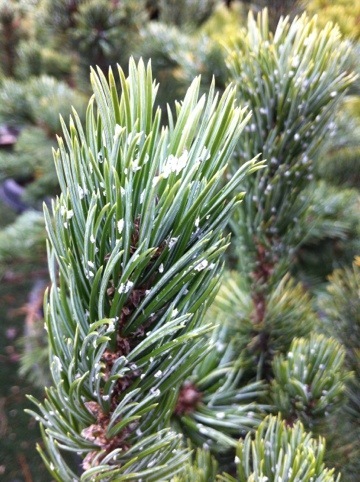 Elaine, what an incredible history for a wonderful tree…..thx for sharing it! !